9 September 2018 was an unforgettable moment for crypto fans in general and Bitcoin enthusiasts in particular. The stalwart of the crypto world, delivered a price surge rarely seen in cryptos or for that matter, in any type of stock. The price of BTC jumped from a little under $6,200 to $6,450 – this in a matter of seconds. Interestingly 9 September 2018, was also a landmark day for Glitzkoin, the first diamond blockchain to be promoted by a diamond veteran. It was the day when Glitzkoin released an important image on its Instagram channel – [9 Sep 2018 Glitzkoin Instagram] The Instagram post urged crypto enthusiasts, to reduce their over indulgence in Bitcoin and support other worthy blockchain projects. 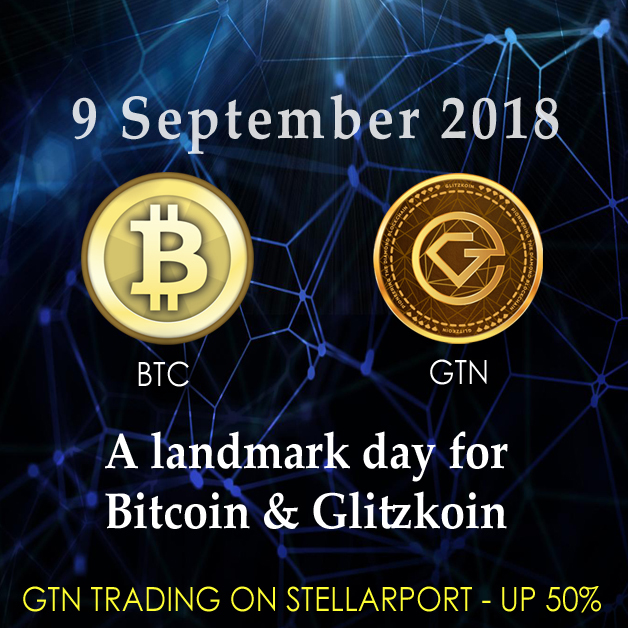 The post also made a mention of the Glitzkoin GTN token price at the time (September 2018). The token was trading on the Stellarport exchange at around $0.18 to $0.22, very close to its ICO closing price of $0.20. The BTC was doing well too ($6,450) though it was a distant cry, from its December 2017 high of $19,000. Life went on and the crypto pundits, showered praise on Bitcoin, they predicted a December 2018 price of around, $20,000 for the king of cryptos. As November 2018 set in, it became clear that BTC had a few plans of its own. Bitcoin prices started to slide down, the crypto ended 2018 at a disappointing $3,700. Close to a 50% drop when compared to the price achieved after, the phenomenal gush of 9 September 2018. Crypto markets slumped and crypto enthusiasts, seemed to lose most of their positivity and enthusiasm. Glitzkoin with its clear and comprehensive project plan, impressed seasoned crypto traders. The project makes a direct connect to the multibillion dollar diamond industry. The objective of Glitzkoin is to improve efficiency and market scope for the glittering industry. The GTN token which was then (September 2018) hovering around its closing ICO price ($0.20), experienced a spurt in demand on the Stellarport exchange. The token moved up to the $0.30 mark, adding a hefty 50% to its ICO closing price. The number of GTN token holders broke through 12,000. Sketching a quick summary, here is what happened to BTC and GTN from September 2018 to January 2019 (at the time of writing this report). While the BTC nosedived from $6,000+ to around $3,500, the GTN token surged from $0.20 to $0.30. The same pattern continued into 2019, the Glitzkoin GTN token maintains its impressive 50% appreciation, the BTC continues to languish around relatively low numbers. Brief notes for the Glitzkoin project and GTN token have been provided below but, let us address one often asked question right here. So why do the crypto savvy, continue to support the Glitzkoin project. The answer lies in the strong project plan laid out for the project. Unlike Bitcoin which is supported by nothing more than speculation, the GTN crypto has a strategic role to play. Besides being actively traded on the Stellarport exchange with, robust support from the crypto world, the GTN token is also the designated mode of payment on DiaEx – the comprehensive diamond trading platform (launch Q1-2019). The demand for the token is further fortified with, new business partnerships being inked. In a recent development, Glitzkoin became the official payment partner for online ticketing giant, Myticket.asia. Starting the first quarter of 2019, purchasers using the popular ticketing portal, could pay for their purchases using the GTN token. It is quite clear that the Glitzkoin blockchain project is steaming ahead, powered by three potential sources of demand. The crypto community sees the potential in having multiple demand sources for the GTN token. Diamond traders have long hoped to have their own tech based trading platform and of course, a mode of payment that is not entangled with the cumbersome and expensive banking system. Glitzkoin Project Summary: Conceptualized to map the powerful features of digital currency and blockchain, against the weaknesses and needs of the diamond industry, Glitzkoin is promoted by second generation diamond veteran, Navneet Goenka. The project is poised to improve efficiency and market scope, for the $90 billion industry. Glitzkoin includes a comprehensive diamond trading platform – DiaEx, that supports B2B and B2C trade in the precious stone. The GTN token is the mode of payment on the DiaEx platform. It is interesting to see how the crypto community supported the Glitzkoin project and GTN token, all through the ICO and continue to do so until today. The GTN token surged to a record high of $0.30, adding a hefty 50% to its ICO price of $0.20. This at a time (November and December 2018) when much of the crypto market was blanketed by losses triggered, by a steep fall in Bitcoin prices.